Industrial designers are often faced with the question: How to improve a product without impairing the quality characteristics responsible for its success? 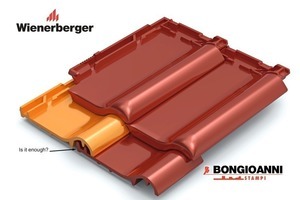 This challenge was taken up by the staff at Wienerberger’s Tegelen plant in the Netherlands and Bongioanni Stampi in the further development of the FD roofing tile. Since the start of its manufacture, 25 million of this best-selling roofing tile have been sold, although sales have dropped in recent years. The goal was therefore to update the technical features of the tile. All tile installation aspects (joints, impermeability, fixing…) had to meet the latest requirements, while the aesthetics of the FD tile were to be preserved. This meant switching from a fixed sliding clearance to a variable clearance (30 mm) while preserving the impermeability of the tile and re-using the currently available moulds. In addition, around ten accessories were developed in order to offer a full set. The tile was improved in several steps. 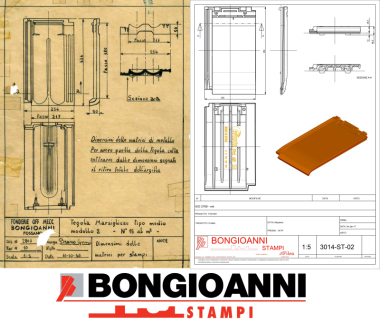 The different tasks were shared between Wienerberger and Bongioanni Stampi based on 3D files, allowing them to meet market needs while fulfilling technical conditions. Resin prototypes were used to assess and preserve the aesthetics of the tile and its installation characteristics. In this way, the requirements in the different production steps could also be met (setting on dryer frames, firing, setting on conveyor belts and pallets…). 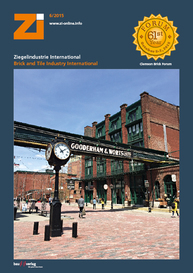 The exchange of information based on the 3D files was the key to the success of this project. The files can be assessed on different computers. 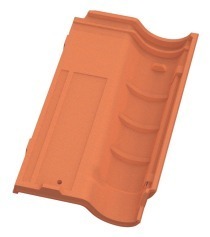 The roofing tile can be turned in different directions, enabling comprehensive inspection. On rotation of the roofing tile in all directions, certain elements can be hidden and others added (»1). In this way, it is possible to resolve any issues and instantly update the data. 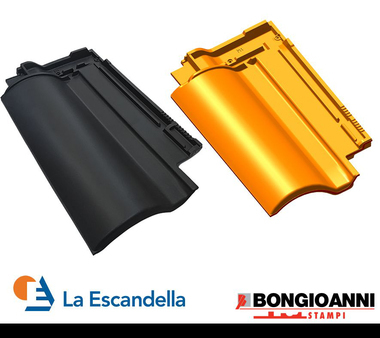 The Bongioanni Stampi prototype system contributed to the rapid development of the new roofing tile and a complete assortment of accessories. That applies both, to the individual prototype for industrial scale and the up to ten accessory products made with a temporary mould. This made it possible to meet Wienerberger’s expectations. The new Alegra 12 now successfully replaces the FD roofing in Wienerberger’s product portfolio.